An authentic Peruvian restaurant located in the heart of Oakland. Tambo offers a selection of types of ceviche, an assortment of Peruvian tapas, and a variety of organic South American beers and wines. Tambo is staffed by knowledgeable and trained professionals with a focus on customer service! Tambo has been recognized as a REAL Certified restaurant by the United States Healthful Food Council. This means that patrons can rely on the restaurant for nutritious, sustainable and tasty food! California halibut in a classic leche de tigre with red onion, habanero, cilantro, peruvian corn and yam. Seasonal fish, calamari, and shrimp in aji amarillo leche de tigre seasoned with cilantro, red onion, habanero, and cancha. Bath in our pesto sauce with leche de tigre, red onion, peruvian corn and fried yam. Fish, clams, mussels, shrimp in our special rocoto leche de tigre. With olive creamy sauce, seasonal fish and octopus, red onion. Seasonal fish with shrimps in our special tambo sauce and peruvian corn. Shrimp, seasonal fish with lemon juice covered with our special nikkei sauce, roasted sesame seed, avocado and yam tanning. 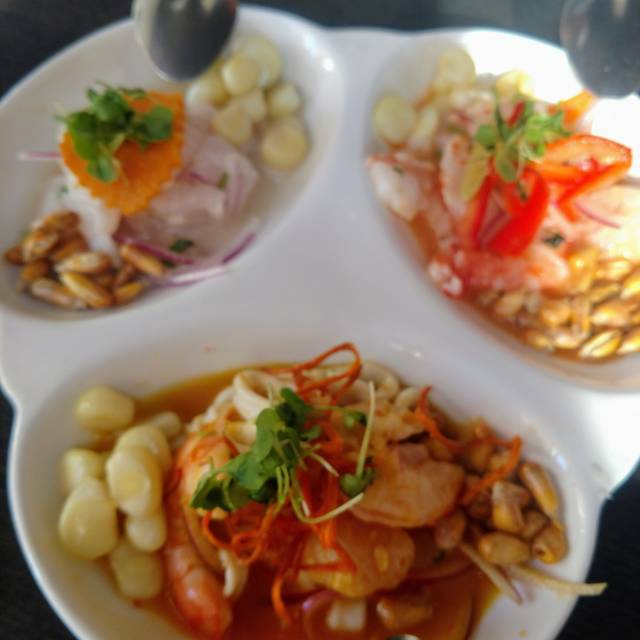 A sample of three ceviches. Bell pepper filled with organic quinoa, mushrroms, corn and raisins. Served with salad. Mushrooms with red onions, green onions and tomato, sauteed in our special soy sauce reduction. Organic quinoa sauteed with red wine, aji amarillo, mushroom and spinach served with grilled asparagus. A traditional peruvian chilled mashed potato cake. Yellow potato causa with dungeness crab on top with avocado puree, quail egg, cherry tomatoes with huancaina sauce and basil cilantro oil. Crispy prawns, avocado puree and sarza criolla topped with golf sauce and basil cilantro oil. Puree of artichokes, asparagus, avocado, and tomato cont on top of yellow potato causa with huancaina sauce and basil cilantro oil. A sample of all our causas. Classic peruvian chicken stew in aji amarillo sauce, served with huancaina sauce and sarza criolla. Special our k'allanpa sauce made with portobello and champignons. Peruvian's favorite dish inside an empanada with beef, red onion & tomato in soy oster reduction, with rocoto sauce & sarza criolla. Sweet corn, cilantro and cheese inside an empanada. 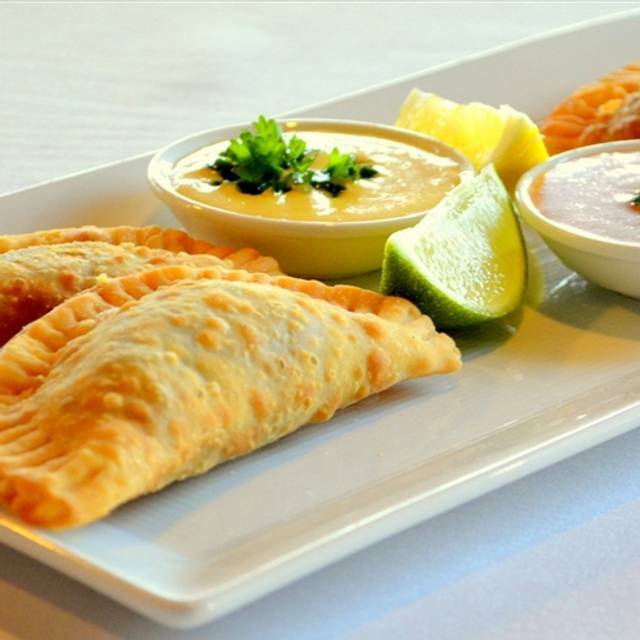 A sample of all our empanadas oerings. Grill beef hearts with fried potato, peruvian corn, rocoto sauce, and sarza criolla. Grilled chicken with fried potato, peruvian corn, huancaina sauce, and sarza criolla. Beef brochette with fried potato, peruvian corn, ocopa sauce, and sarza criolla. A sample of our brochette. Two seasonal fish brochette and one of shrimp, covered in our anticuchera sauce, served with chimichurri. Slices of boiled potato, quail egg and black olive with huancaina homemade sauce. Boiled mussels topped with chopped onions, diced tomatoes, olive oil and lime juice. Crispy seasonal fish served with sarza criolla and homemade tartar sauce. Traditional peruvian style stir-fry of beef tenderloin, sautéed with onion, tomatoes, green onions, cilantro, garlic and soy sauce with fried potatoes and rice. Peruvian classic with a chinese style, stir fried rice with chicken, eggs (tortilla style), green onions, sautéed with soy sauce, oyster sauce and peruvian spices. Fried seasonal sh served with a fresh mixed green salad. North peruvian seafood combination of mussels, calamari, fried rice, bell peppers, peas and choclo. Sautéed with black beer, cilantro, huancaina sauce and sarza criolla. Crispy calamari, shrimps, mussels, clams, seasonal fish and yucca with sarza criolla, choclo, tomato and homemade tartar sauce. Chicken stew in a bit spicy, nutty cheese and aji amarillo sauce. Served with rice. Marinated leg of lamb in chicha de jora and slowly oven cooked, with peruvian herbs garnished with "ajiaco" stew served with peruvian beans and rice. Traditional peruvian style stir-fry of chicken, tomatoes, onions and spaghetti with soy sauce. Fish filet topped with seafood sauce served with white rice. Combination of fried seafood, rice, peas and peruvian corn, sauteed in aji amarillo, served with sarza criolla. Seafood rice, shrimp, squid, fish, mussels, clams, seasoned with aji amarillo and aji panca. Light soup with chunks of white fish fillets and seasoned with vegetables. Delicious mussels soup with cilantro, white wine and aji panca. Organic quinoa, peruvian corn, queso fresco. Cilantro, olive oil, lime juice. Grilled breast chicken, romaine lettuce, parmesan cheese, yucca croutons and huancaina sauce. Organic wild arugula, spinach, lettuce, cherry tomato, hearts of palm, choclo, queso fresco and an aji amarillo and passion fruit vinaigrette. Grilled marinated breast chicken, lettuce, tomato & homemade mayo. Stir fried beef sautéed with onions, tomatoes, and soy sauce. Delicious combination of spinach, grilled asparagus, lettuce, avocado, roasted bell peppers, and tomato with our special sauce. Silvered pork loin, fried yams and sarza criolla, served with anticuchera sauce. Breaded steak, sweet plantain slices fried, topped with fried egg. Ceviche Good and paella very good. I didn’t realize that empanadas were fried rather than baked. They weren’t greasy but I just don’t like fried food. Quinoa salad was tasty but had too much dressing . My friend liked his lamb dish. Great service and food was delicious. it was just perfect for a fun night in Oakland. The food and service was incredible. I will definitely be back very soon! The ceviche was the best I ever had! Not a single drop left on the plate. Great customer service and most authentic Peruvian food in the area, tasted just as I was in Peru! My first time here and my wife and I loved it. I was in the mood for Peruvian, so I made reservations for dinner. Everything was delicious. We started off with the mixto ceviche which includes calamari, sole, shrimp, and two different types of corn. It was so flavorful and had a nice amount of heat. I ordered the Lomo Saltado, which is beef tenderloin, tomatoes, fries with Tambo Lomo sauce and rice. You can also add a fried egg and substitute rib eye for the tenderloin both of which I did. I really liked the dish as ordered. I wasn't sure the fries and the rice would work together, but it was very good. The wife ordered the Patarashca, fresh trout with aromatic spices, citrus garlic sauce, sweet plantains served on a banana leaf. We both really enjoyed the trout, it was so tasty. For dessert, we had the alfajores which are a light and flaky cookie that are not overly sweet. It was a great finish to a great dinner. Amazing experience! I made reservations for my boyfriend's birthday as a special treat since he's Peruvian and we both love trying new restaurants. It was a good idea that we arrived 15 minutes early because we were seated almost right on time - there's a bit of a wait especially since his birthday is on Valentine's Day. I ordered lomo saltado, replaced the beef with ribeye, and had two orders of their Clasico ceviche. Both were amazing, hence why I ordered two ceviches. My boyfriend ordered a seco I believe and beef empanadas (he also ordered two of the latter). Let me just say that the lomo brought me to tears. The level of intent and art infused in the dish! Oh my! and the green onions on top - you almost never see that at a peruvian restaurant but it was a tip as to how knowledgeable they are about balancing and emphasizing flavors. The chicha morada was really good as well. Great food and friendly service! Street outside was piled high with trash and ruined ambience of evening and restaurant! Makes one wonder about cleanliness of this restaurant. We went to Tambo on a Friday night and it was fairly busy. There was only one person who was serving, taking orders, seating folks, making drinks, etc. We stood around for 10 mins before they could seat us but that's OK as the service and food after was fantastic. The lady who served us, the only staff that night, was lovely and apologetic. She gave us a free drink for the wait. Overall, a lovely restaurant in Oakland. Great food and service. I had the passion sangria (yum) and Quinoa Salmon (delicious). Pricey but delicious and filling. Definitely worth the experience if you love food. Server was very kind. Bit slow due to maybe one cook on the day we went. Ceviche was so delicious. Plantains were perfect. All food was fresh and flavorful. Decor was clean and lighting was perfect. Small restaurant so reserve a table during peak times. And got a bit noisy. Would go again for sure. Ths food was outstanding from start to finish. The empanadas were heaven and the trout was one of the best meals I've ever had! Wonderful fresh food and good service. I will return again . Tambo is an oasis in that part of town. Fabulous food, great prices, and the staff are welcoming, attentive and just make you feel comfortable. Great find for a pre concert dinner. Shared the Ensalada Anduna, and enjoyed the Lomo Saltado and the Seco de Cordero. We enjoy the complexity, balance, and affordability of the Chilean and Argentinian wines they offer. Excellent food, well prepared. Lunch service was slow and a bit chaotic - but it appeared someone had not shown up to work that day. This food was amazing! The flavor was superb and the plate sizes were also generous. Looking forward to going again!! Love the food and service here! We had a wonderful Friday night date with great drinks and service. Loved that on this occasion my fish dish was ready sooner than my partner’s and the waitress brought my dish out not wanting it to get cold. And we split that and then shortly the other dish came out. We usually split whatever entrees we get so it was just perfect!!! The food was nicely done and the server was exceptionally attentive and friendly. I enjoyed my fist try of Peruvian food and beer. We booked a table for a large party on a Saturday night. Everyone was late. I know how inconvenient this is for a restaurant but the servers and host were so accommodating and friendly. The appetizers and salads were exceptional. We had a variety of items, fish, steak, paella. Everyone thought their meal was delicious. I can't wait to go back. Really great Peruvian food. Excellent flavors and great variety. Super happy with all they had to offer. I would recommend asking to space our your order. We did not Ana everything came st once which was a little overwhelming. Might want to keep a menu and order one thing at time, as they were quite quick on appetizers and salads. Enjoyed the meal, but seemed to have less authenticity than previous visit. Made reservations at 8pm and ordered at 8:10, I didn’t get my food till 9:05 and not once did the waiter come ask us how we were doing or even let us know that our food was coming. I also had to go to the bar to get another drink. Overall the food was good but the service was horrible. I enjoyed the food but we basically had to beg for it. More than once. The kitchen was really backed up. After asking for our food 4 times, they admitted that they never put in our order. Once they realized it, they were apologetic and gave us a good bit of free food and sangria. Arrived a few minutes late for our reservation but were seated quickly. All or virtually all of the tables were full, but they only seemed to have two people working the tables on a Saturday night. Ordered food relatively quickly, but it took 40+ minutes for our food to arrive. Two tables that were seated after us got their food before we did. I ordered the chicken, my wife the fish entree. My dish had virtually no taste, no vegetables, and one potato wedge about the size of a french fry. The plate was basically standard white rice and stringy tasteless chicken with a tasteless sauce. My wife's dish was fine. Overall, we had to wait too long to be served food that was well below par. I read the other reviews for this restaurant and despite the fact that there were a number that said that the place was only fair, we decided to go anyway. Don't order the chicken and be prepared to wait longer than you should for overpriced mediocre food and service. Tasty ceviche and empanadas. Ribeye was yummy but potatoes undercooked. Drinks and other dishes also tasty. Service slow. Ended up pricier than expected for a Tuesday night, however - about $60pp. We had a 7:30 reservation and weren't seated until 8PM. The food was good but the ceviche was a bit chewy and did not sit well with me that night. They ran out of Empanadas and Lamb. They definitely need more staff to help. I would recommend Tambo only if you are not hungry or in a rush. Great find in downtown Oakland. The restaurant was understaffed the evening we were there, so things were slow but the server was apologetic and very nice. What really mattered was the fantastic food at a good price. Small to medium sized plates, food was tasty, service we good.. I would recommend. Valentine’s Day Treat! So yummy! Food was fresh and flavorful - the flavors in our appetizer (ceviche sampler) and entrees (lamb and paella) were good though nothing special or exciting. Service was warm and friendly - it's fairly casual but nice. I felt the prices were a little high for what we were getting... not shocking but the ingredients were pretty basic for near $30 entrée prices. I've been to another Peruvian restaurant (Parada) and felt that they had more variety, flavor and new/different tastes to offer than this restaurant - I would have liked to see that here too. The food and service was great! we had the beef empanadas it was a great choice! We also had Seco and it was total comfort food the lamb was tender and very tasty! The ceviche was delicious and I loved the rocoto hot sauce. Our waitress was lovely ! One of entrees was terrible and food was cold. Excellent! I would definitely come back here. The lono saltado was really really good! I hadn’t been to Tambo for a little over a year, and it has changed a lot. They used to have way more food and drink options, i was truly disappointed. 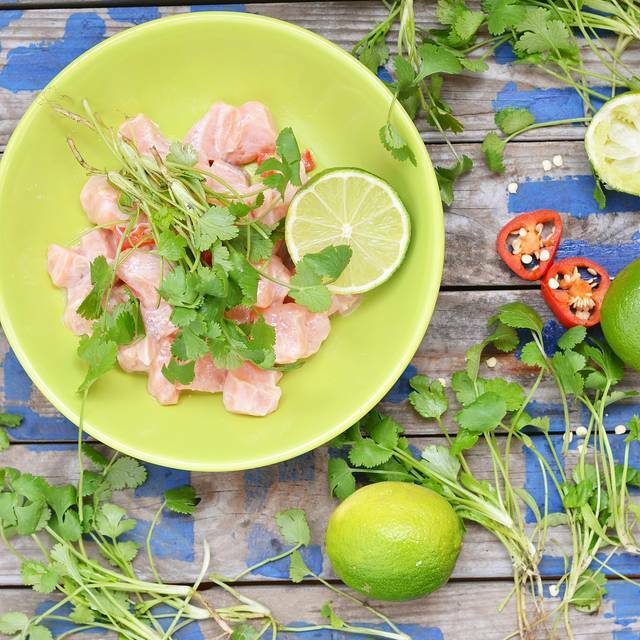 Wednesday ceviche day! Buy one get one free! I take my mother to dinner about once per week, somewhere in Oakland. We have tried dozens of restaurants throughout the city, and we enjoyed this as much or more than anywhere else. The Peruvian food was creative, different, and exciting. We liked everything (save room for desert). The noise level was perfect (Sunday evening), and our waiter was friendly, attentive and prompt. The wine list was not long, but really fun to explore. It was a relaxed, comfortable and pleasant experience; the kind worth repeating regularly.